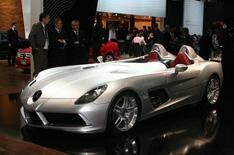 Mercedes SLR Stirling Moss | What Car? Gentlemen of a certain age will go misty-eyed at the mention of Stirling Moss name. For many, the 1950s F1 racer epitomises the ultimate racing driver fast, daring but ultimately a gentleman, albeit one who liked to party with a lady on each arm. Its a fitting tribute, then, that this Mercedes-Benz SLR McLaren supercar carries both his name and shares some of his ideals by being ultimately quick, but also refined. The car has no roof, side windows or windscreen, and is powered by a 641bhp 5.4-litre V8 supercharged engine. There are two tiny wind protectors to shield occupants from buffeting. It accelerates from 0-62mph in less than 3.5 seconds and has a top speed of 217mph. Despite this, Mercedes says it is a car for the road, not the race track. The standard car has 617bhp, accelerates from 0-62mph in 3.8sec and has a top speed of 206mph. Safety is catered for by two roll hoops behind the front seats, which are integrated into the bodywork in two air scoops. Other details include forward-opening swing doors, an air brake that extends when braking at more than 75mph to aid stability and an interior that has been stripped down to the bare essentials. It has been named after racing legend Moss because of his success at the wheel of Mercedes SLR racing cars in the 1950s, including winning the Mille Miglia road race in a record time. Just 75 cars will be sold at a price of 750,000 (about 700,000). That compares with 350,000 for the standard car. They will be the final SLR McLarens built, with production starting in June 2009. Existing SLR customers will have priority on ordering the car.